Have you seen our new sizzling hot rental cars now available to hire on a self-drive hire basis in the UK from Signature Car Hire? We have updated our fleet of supercars and everyday rental cars to represent what our clients want and to ensure we have a top notch fleet of hire cars available during the sizzling hot summer months. If you are coming to London on business or pleasure, then renting a sports car from Signature is hassle free and quick! Simply choose the car you like on-line and submit an on-line quote, we’ll email you straight away with a quote. Our pricing is transparent and we feature pictures of the actual car (not stock photos!) so you’ll know exactly what you will get when your rental car arrives. For techno heads there is also plenty of specs and tech info on our website about the cars too. A must have for Bond fans! 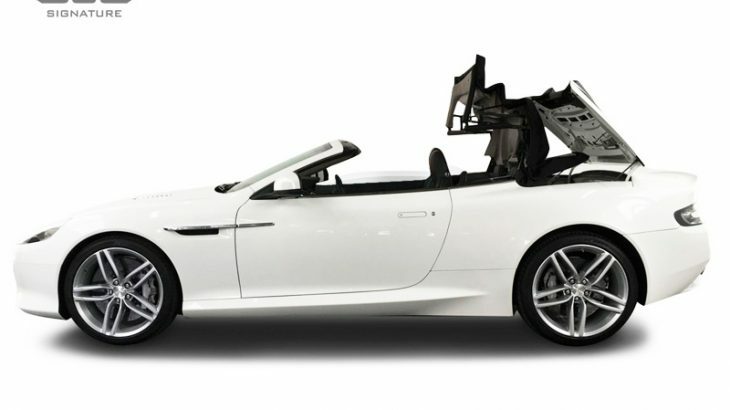 Our glossy white drop top Aston Martin DB9 Volante is sleek and sophisticated. The retractable roof is made of folding fabric and takes just 17 seconds to be put up or down, perfect should this sudden heat wave disappear! It has plenty of impressive stats too and comes with a 6-Speed Touchtroinc 2 automatic gearbox, 6L, 48 Valves, V12 engine, 510 bhp of power, 620 Nm of Torque, a top speed of 183 mph and an impressive 0-60mph 4.5 secs. If you want to rent a convertible sports car in the UK, then our stunning white Audi R8 V10 Spyder with red roof is a great choice! With a large 5 litre high performance, naturally aspirated V10 engine this rental sports car will get you where you want to go without any delay! The A8 positions itself as a supercar yet offers everyday usability as a run-around rental car that still gets you noticed. Taking the hood down, for example, only takes 20 seconds whilst doing up to 31 mph. Its stats will still impress, with a maximum speed of 198 mph and 0 – 60 mph in 3.6 seconds. For those looking for a splash of colour, then choose our red and black version! For drivers looking to hire a more refined and elegant rental car, we highly recommend our Bentley GTC in black. The GT Convertible is a top of the range luxury sports car that is spacious but still powerful offering a most luxurious car hire experience. Our rental GT Continental’s incredible power is provided effortlessly by its impressive V8 engine which, on unrestricted roads, can pull its 2.5 Tonne body to a breath-taking 190mph. As a rental car for city driving it is exceptionally easy going and a pleasure for driver and passengers. Our Porsche 718 Boxster rental car is one of the finest handling open-top sports cars in the UK today, with a dazzling chassis and turbo charged engine combined with a very classy two seater interior and an white/red exterior that looks stunning, the overall package is pure Porsche which makes this a hugely desirable hire car choice. The latest Porsche infotainment system has high-definition maps, responsive touch-screen and connectivity to your Smartphone via Apple CarPlay. Aston Martin, Audi, Bentley, Porsche. permalink. Range Rover Velar – The most beautiful car in the World! Copyright © 2005 - 2018 Signature® Cars, all rights reserved.